When we fall in love, we can't help but spend time with the one we love. It becomes way more important than our daily tasks or even our work. In fact, our every thought is geared constantly towards that special one as we hunger to spend time with each other again. It is pure heavenly bliss. Ultimately, this leads to our highlight of life: marriage. Now we are joined together. Now we have the privilege of enjoying each other day in and day out. Sadly, over time, that one we love so tenderly often ends up in second place, or worse. Sometimes they don't even place at all. When finances become scarce or abundant, for example, somehow we start to spend more time away from our spouse. Then there's children. What a blessing! But at the same time, responsibilities increase exponentially, and adversity doesn't help the mix. We end up focusing on our responsibilities, which is good, except that the one we used to dream constantly about is now playing second fiddle. We find ourselves completely out of time. Sacrifices have to be made, and it's usually your spouse who feels the consequences. Little by little we become estranged from one another as our priorities take all of our time. Before we know it, we have become strangers in the same home. Love is on its way out, and it becomes easy in these times to fall into temptation, a trap that will lead us to despair. The only way to keep love alive is to spend time daily with your beloved spouse, who should be your real priority. Walk together, eat together and share your joys as well as your disappointments. Be one, as we are supposed to be! The same is true with experiencing our Heavenly Father. If we don't spend time with Him, we will become estranged as well. A poor relationship always leads to disaster. After all, we were created to genuinely love. When sin appeared, selfishness became the norm, but it doesn't have to be the case. A strong marriage, where we long for one another day in and day out, is the only way where real happiness will occur! What happens when communication breaks down? Take a look at something that happened on June 2, 1763. Local Objiway, with the help of the Matchekewis, planned an attack at Fort Michilimackinac in what is now Northern Michigan. The attack was to take place in the pretense of playing a game of baggatiway, something similar to the modern sport of Lacrosse. What the British soldiers didn't realize is that the native women had concealed weapons. The attack happened when the ball flew over the stockade into the fort. The players rushed through the gate as if chasing their ball, but instead, they seized tomahawks and knives from their women and attacked the unsuspecting soldiers. Within minutes, they were in control of the fort and 21 soldiers in total were dead. Why did this massacre occur? The communication between the British soldiers who occupied Fort Michilimackinac and the local native people had broken down. The British had begun to refuse to distribute gifts, a long-standing tradition that the Objiway considered quite important in order to establish relationships. Also, instead of going to the Objiway camps, the British made the natives travel to all the way to Fort Michilimackinac to trade their furs, and the native people were far from happy. All of this could have been avoided by open communication, for the success of the Objiway attack made the British rethink their policies. They began to distribute gifts to the native peoples, and they began sending fur traders to the native winter camps. 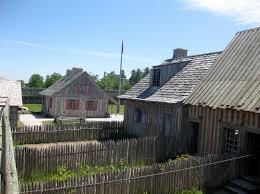 Over time, the Objiway became close friends and allies to the British at Fort Michilimackinac. In fact, during the American Revolution, they actually fought with the Redcoats. Breakdowns in communication always lead to disaster. May we never forget this! Dear Lord, wherever we are in live help us to keep the communication going. Help us to constantly listen to what You have for us to do and to do it. In Jesus’ Name, Amen.